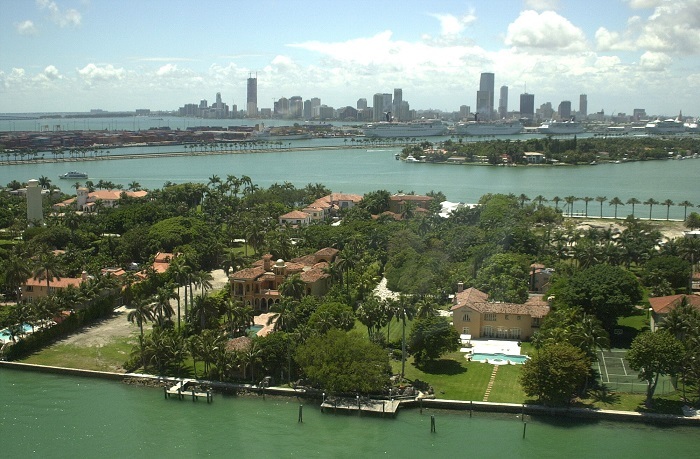 Star Island in Miami Beach Florida is one of the most prized real estate areas in South Florida. Current and past residents include Shaquille O'Neal, Julio Inglesias, Sean Combs, Rosie O'Donnell , Gloria Estafan, Multi-Billionaire Phillip Frost, Al Capone, Harvey Firestone, Madonna, Sylvester Stallone, and Naomi Campbell, among others. Exclusive Star Island sits like a floating jewel in the aquamarine waters of Biscayne Bay, between the main land and Miami Beach. The waters surrounding the island are part of the Biscayne Bay Aquatic Preserve. Star Island is not only coveted for its supreme, unspoiled waterfront location and limited amount of residents, but also for its extreme privacy. 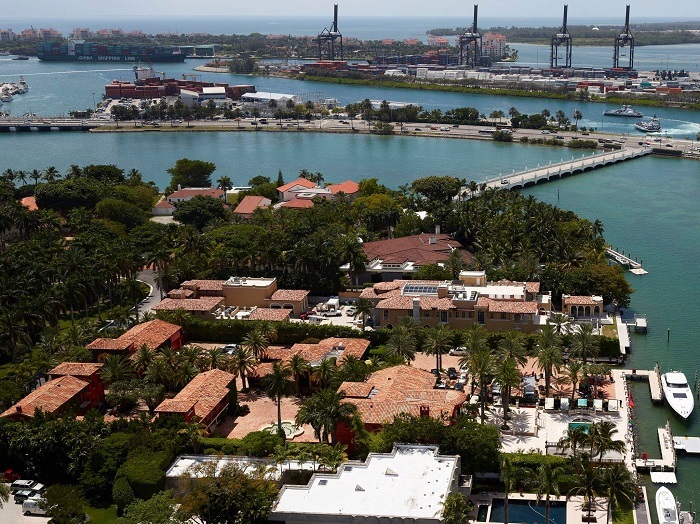 Accessible by just one bridge, the gated enclave is the home of Miami's wealthy elite. Star Island includes only 34 properties, and is coveted for it's location and privacy. Each home on the Island is a waterfront mansion situated on a lot of 40,000 square feet or more. This Star Island property was once home to the marijuana smoking Coptics. See the video below. Gloria Estefan's home on Star Island just went up for sale. Gloria and Emilio Estefan own two mansions on Star Island, and as of today, they are selling one of them (not the one they presently inhabit) for $40 million. 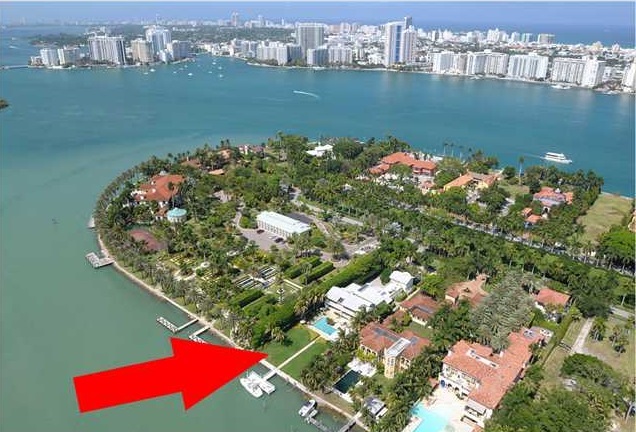 The property located at 1 Star Island Drive (click on the photo above) in Miami Beach's exclusive Star Island was purchased by the Estefans in 1993, and this is the first time they are offering the property for sale. The property is magnificent. 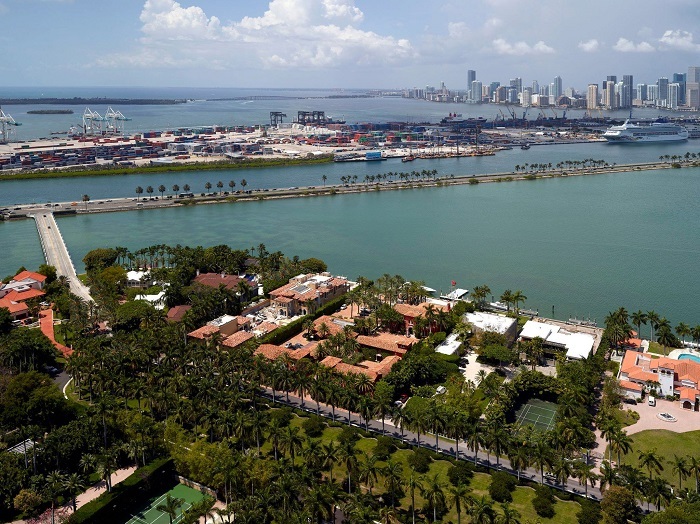 There is a 7,988 square feet mansion size home situated on a very large lot measuring 58,332 square feet in area (1.3 acres), with 240 linear feet of bay frontage, boasting unobstructed views of Biscayne Bay and Downtown Miami. The home is advertised as a beautiful 2-story, 4 bedrooms 5 bathrooms Floridian Villa with open verandas facing Biscayne Bay and a separate and private 3 bedrooms 3 bathrooms guest house. 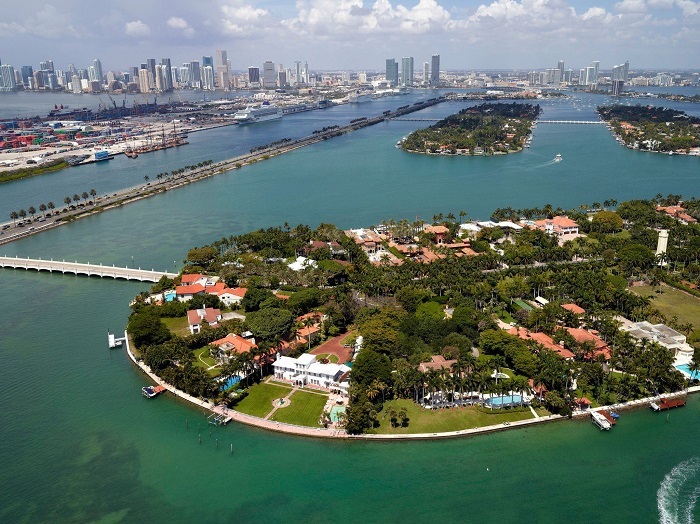 Update: Soon after the Estefan mansion was listed for sale, the owner of the property located across the way on the east side of the island at 40 Star Island Drive, decided to raise the price of his Miami Beach home from $45 million to a mind boggling $75 million. 40 Star has been on the market for sale since 2009, when it was listed for $22.5 million. Since then there have been a several price increases, but this one was a little over the top. The Star Island home of Rosie O'Donnell was sold for $16,500,000. The spectacular Star Island mansion situated on a lot measuring more than one acre has 12 bedrooms, 11.5 bathrooms occupying more than 11,000 square feet of living space. The property was purchased by David and Linda Frankel from Old Saybrook, Connecticut. An 11,000 square feet mansion on a 1.5 acres lot sold for $18,800,000. Located at 31 Star Island Drive, the 10 Bedrooms 8 bathrooms home has all of the goodies including a grand reception room, a formal living room with a fireplace, a cozy parlor with a bar, a gym, a movie theatre, and a double boat dock. UPDATE August 2017 - Both properties (4 & 5 Star Island) were purchased at auction by the original financiers for $40 million. In May 2011, 27 Star Island was purchased for $10,750,000. The new owner proceeded to try to resell the property for $21,000,000, but was unable to find a buyer. The home is in very poor condition, and really needs to be torn down and replaced.However, the Miami Beach Historic Preservation Board has some pretty strict rules pertaining to violations of zoning restrictions, i.e. homes built prior to 1942 and designated as historic. The Star Island homeowner came up with an ingenious idea, along with Stefan Antoni Olmesdahi Truen Architects, a firm out of South Africa. They decided to strip the home down to its bare bones 1924 design, remove the garage and guest house area, and turn the house around 90 degrees, in order to build a 20,000 square feet concrete and glass estate. Although the City has not yet accepted the new design, there does come a time when they ought to give a guy a break, especially when it comes to properties that really don't make sense in 2013. Many of today's homeowners want modern homes to live in, and they should be allowed that much. After all, they do pay the highest property taxes, and support the City of Miami Beach. Why should one not be permitted to make his/her home the way they like? 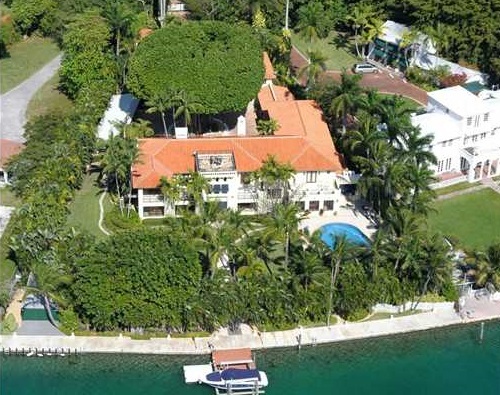 Yesterday Rosie O'Donnell placed her Star Island home for sale on the Miami MLS for $19,500,000. The 11,104 square feet mansion was built in 1923, and boasts 12 bedrooms and 11.5 bathrooms on well over an acre of land. Although the price may seem a bit steep, even for Star Island, all of the homes for sale on the island have been climbing in asking price, as the perception of homeowners in this exclusive Miami Beach community has recently changed. Everyone seems to think that luxury homes are once again going up in price. Although that may be true in theory, it has not become a reality. For example, just last month two vacant lots, 35 Star Island and 36 Star Island closed for $8,500,000 each. That is an increase in price, as some see it, because just one year ago the same two lots sold for $6,125,000 each. As the Miami real estate market continues to improve, one can expect the attending rise in prices. Star Island, Miami Beach’s most sought after real estate, is once again in the news, as one of Star Island’s most amazing sales took place just a couple of weeks ago, when Rosie Hallbaur, the previous owner of 22 Star Island Drive, sold the 58,906 square feet lot, along with a structure which will surely be torn down at some point in the near future, for just $7,500,000, less than the tax assessed value of the property. The buyer was 22 Star Island LLC, a corporation which, according to Florida State corporate filings, seems to be attached to Brian Bilzin, the owner of another very large Star Island property. The property is one of Miami Beach’s most prestigious lots, in that it is situated on the very tip of the Island facing north-northeast, and boasts incredibly beautiful views of Biscayne Bay. Mr Bilzin must be congratulated as one of Florida’s most savvy buyers of real estate. 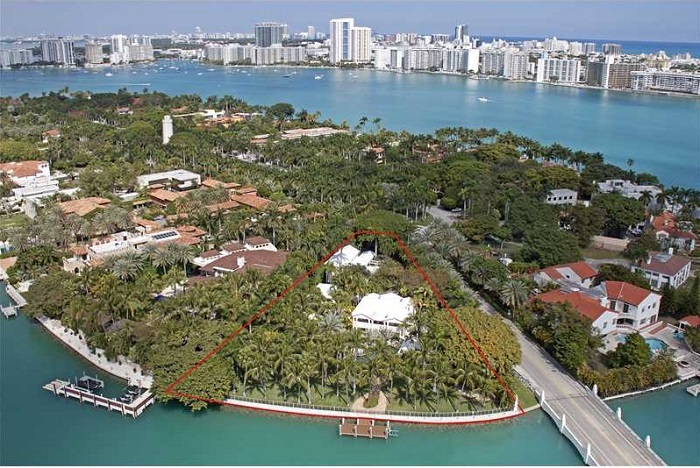 The Star Island home of Claudio Osorio and his wife Amarilis was sold at auction on Thursday for $12,720,000. The auction was part of a bankruptcy plan that allows Osorio to once again take over the reigns of his failed high-tech building materials company. The property located at 15 Star Island Drive in Miami Beach is a 9 bedrooms home with approximately 8,700 square feet of interior living space, situated on a 40,000 square feet lot, with 100 feet of water frontage. The house, although contemporary in design, is in need of total renovation. Three other Star Island properties have sold this year for prices ranging between $10,750,000 and $25,500,000. At this time 5 properties are for sale on the island, including a vacant lot at 30 Star Island. The best deal on the island right now is an 8,100 square feet home, with 205 linear feet of water frontage lining a 48,266 square feet lot. The property located at 42 Star Island is in need of total renovation, but seems like a bargain compared to the sale that took place on Thursday. 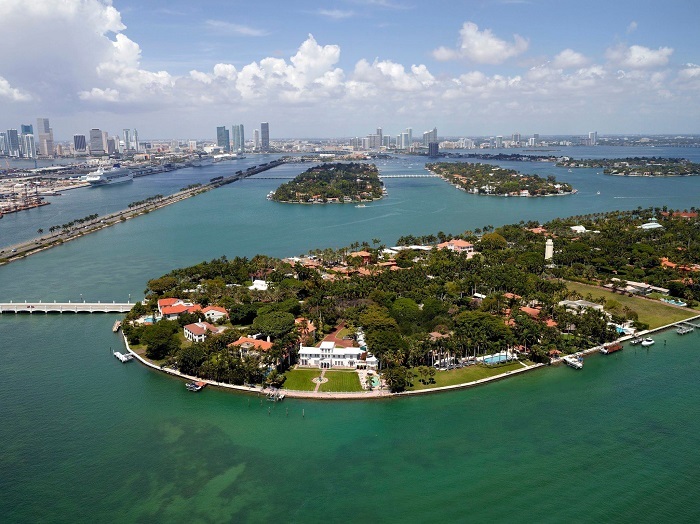 Star Island, as many Miami Beach residents know, is home to the rich and famous, including Sean Combs, Gloria and Emilio Estafan, Rosie O'Donnel, and Naomi Campbell and her billionaire boyfriend. In March of this year 10 of the 34 properties on Star Island were for sale. Five of those properties sold in the past 4 months, and just this weekend, another home was listed for sale on this exclusive island, a virtual gated enclave, accessible by just one bridge. 42 Star Island Drive is now for sale for the first time since 1978, when it was purchased by its present owner. The home, built in 1925, and undoubtedly one of Miami's finest properties, is situated on a 48,266 square feet lot, with 205 linear feet of water frontage, overlooking beautiful Biscayne Bay in Miami Beach, Florida. The 8 bedrooms 7 bathrooms home, with 3 guest houses, awaits the right person to restore some of it’s wonderful classic features. The property boasts an 8 ton boat lift with 4 boat slips, and a top of the line security system, with cameras all around the property. The price -- $10,500,000. There are 3 other homes for sale on the island at the present time, including 5 Star Island Drive ($49,995,000), 40 Star Island Drive (29,500,000), and 29 Star Island Drive($21,000,000). 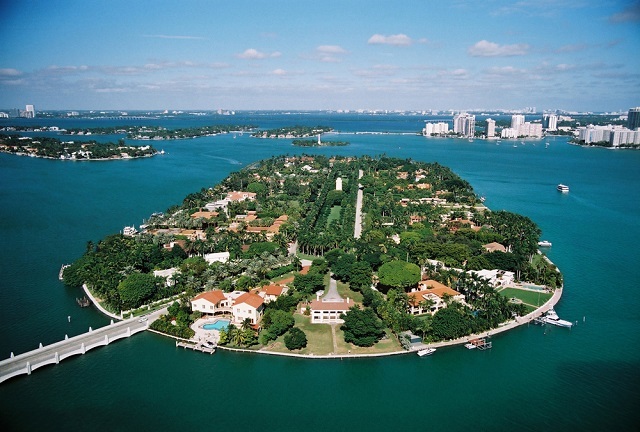 Star Island homes have suddenly become readily available to the rich and famous. 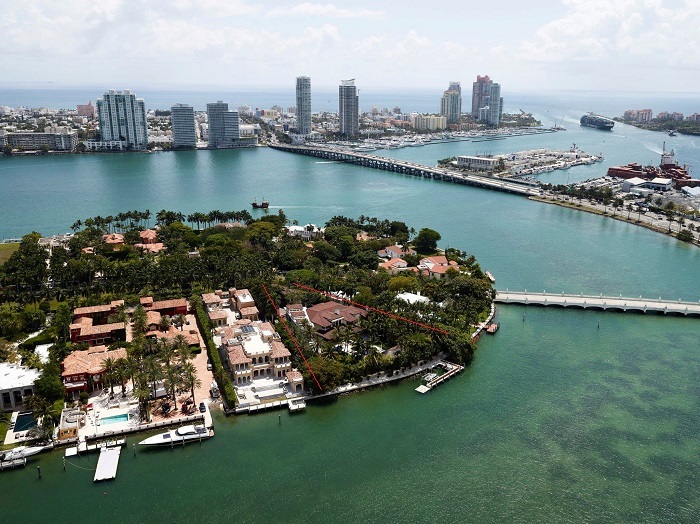 Star Island, long considered the most exclusive community in all of Miami, is composed of 34 waterfront properties. Some of the most famous people who live in this very pricey community are Sean Combs (P Diddy), Gloria and Emilio Estafan, Rosie O’Donnel, and Naomi Campbell and her billionaire boyfriend (who bought the mansion previously owned by Shaquille O’Neal). The largest property on Star Island is a 28,000 square feet mansion situated on a 6 acre parcel of land, owned by Phillip Frost and his wife. Frost used to run a large American drug company called IVAX, which was sold several years ago, to TEVA, an Israeli drug company. Star Island real estate and homes - Today, 10 of the 34 properties on Star Island are for sale. Never before have so many Star Island homes been offered for sale at the same time. Four of the properties are vacant lots, valued by their owners from $7.9 million to $8.9 million, although it is unlikely that any of them will sell for those rather hefty prices. The other 6 luxury homes for sale are priced from $9.875 million to $49.995 million. The following properties are presently for sale on Star Island. Whether or not any of these ultra-luxury Star Island homes are sold this year, is left to be seen, but if some of them are sold, it should come as no surprise, in light of a report published yesterday by the Miami Association of Realtors. 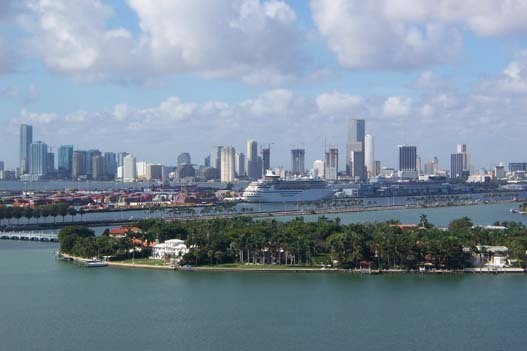 The report states that pending sales of homes and condos, an accurate indicator of future market conditions, rose 22 percent in Dade County last month, year over year to 11,182 from 9,164 in February 2010. Star Island in Miami Beach is home to the stars, and is one of the most exclusive communities in Florida. The island consists of only 34 properties, and is coveted for it's location and privacy. Residents of Star Island include celebrities Sean Combs (P Diddy), Gloria Estafan, Rosie O'Donnell, and New York Yankees star Alex Rodriguez (A-Rod). Recently, a home previously owned by NBA basketball star Shaquille O'Neal, was reportedly purchased by Naomi Campbell's billionaire boyfriend, Vladislav Doronin. Perhaps the single most prized property on Star Island is a 6 acre parcel of land located on the northwest tip of the island, owned by billionaire Phillip Frost and his wife. Mr Frost was the chairman of a arge drug company, Ivax, which was sold several years ago. Situated on this amazing waterfront lot, is a 28,000 square feet mansion which was built in 2001. 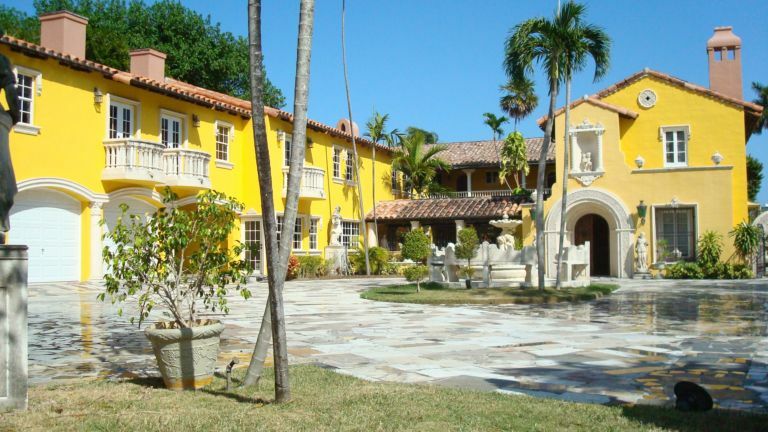 According to the Dade County property records, the property is assessed at a value of slightly more than $58,000,000, and the annual property taxes in 2008 were $730,000. 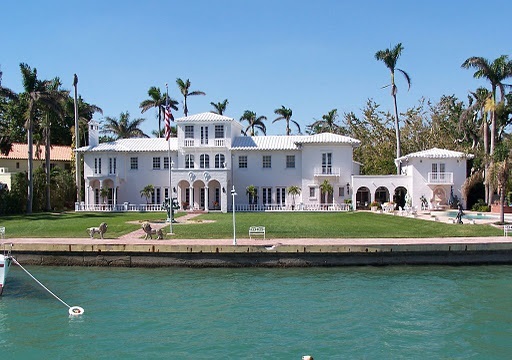 Below is a video tour of the property taken from Biscayne Bay. The following is a reprint of an article published today quoting Alex Shay's view of Star Island real estate. The recent revelation that basketball star Shaquille O’Neal finally sold his mega-manse on swanky Star Island for $16 million — a substantial discount from the $35 million he once sought — might not thrill his neighbors. They include Rosie O’Donnell, Gloria Estefan, Sean “P. Diddy” Combs, Lenny Kravitz and billionaire Phillip Frost, and it’s a safe bet none would welcome being added to the list of celebrity poster children for the luxury housing crunch. The sale price of $16 million is a mind-numbing drop of 54 percent from his original list price in 2005 of $35 million. It was a great deal for the buyer, Vladislav Doronin, the Russian billionaire boyfriend of supermodel Naomi Campbell, but what does that mean for the market value of neighboring houses? Some real estate experts say that the sale of Shaq’s house and an $8.1 million August 2008 transaction for the mansion next door to Rosie are the latest comparable sales figures for the ultra-luxury enclave, and as such have established a new, drastically dropped floor in pricing for the exclusive man-made island. “Star Island is down at least 50 percent from two years ago,” said Carlos Justo, a real estate broker to the stars who sold Rosie, Diddy and Estefan their homes. Justo ran into his own troubles investing in high-end homes, and made headlines last spring when he declared bankruptcy and said he was $20 million in debt. But others dismiss the theory Shaq’s house will sink sales, saying there are only 35 homes on the hyper-exclusive island in Biscayne Bay. Only the very wealthy can afford the rarified luxury of Star Island and there are never more than a few homes on the block at a time. “It’s simple supply and demand,” said Alex Shay, who sells luxury homes in Miami Beach. 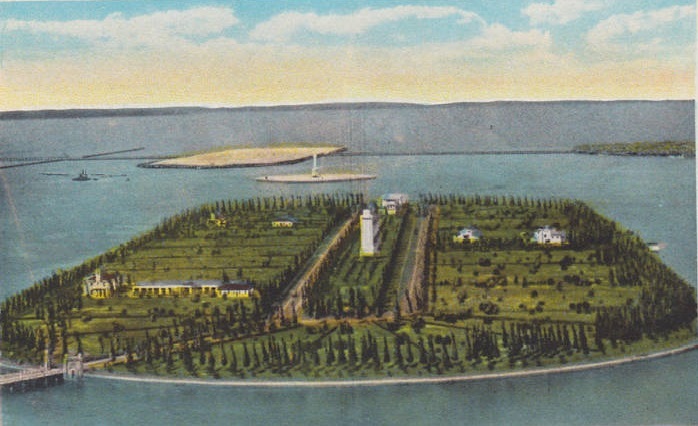 “There is only one Star Island; nothing else compares to it.” Star Island is an oval-shaped, man-made island created in 1922 by Carl Fisher, an automotive parts pioneer and the co-founder of Miami Beach. The U.S Army Corps of Engineers dredged sand to build Star Island and several neighboring islets, including Fisher Island, where homeowners include Julia Roberts, Oprah Winfrey and Mel Brooks. Although Shay doesn’t think that Shaq’s sale alone will drive prices down, he says Star Island and most of Miami Beach have not seen property values increase since 2003 or 2004, the peak of the market. Shay and Justo agreed that sellers still insist on asking more than their homes are worth and buyers are just as stubbornly offering at least 20 to 30 percent less than the asking price. “Greed hasn’t gone anywhere and foolishness is everywhere,” said Shay. Last August, Dr. Cem Kinay, a physician, luxury resort developer and owner of a 560-acre island in the Turks and Caicos chain, bought 44 Star Island in an estate sale for $8.1 million, a discount of 17 percent from the asking price of $9.75 million. “Dr. Kinay’s home and Shaq’s will establish a new level,” said Justo in an April interview. 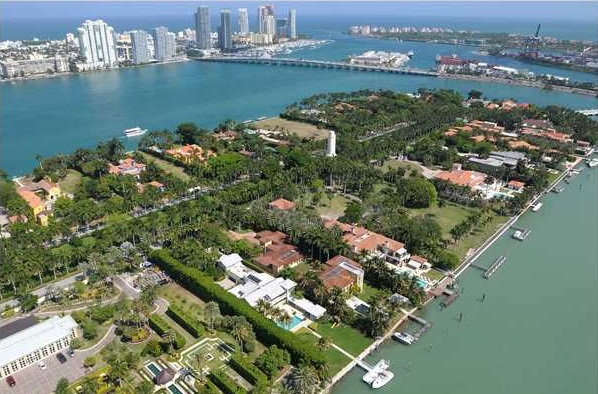 The biggest sale on the island, which also set a record for Miami Beach, was in 2006 when Stuart Miller paid $27 million for three one-acre lots and 300 feet of waterfront. Miller is the president of Miami-based Lennar Homes, which has suffered enormously in the housing bust, with its stock price sinking 80 percent in the past three years. On an island where waterfront is precious currency, Kinay, only two years later, paid $8.1 million for 250 feet of waterfront and a one-acre lot. Kinay’s next-door neighbor, Rosie, put her Star Island home on the market for $16.7 million in 2003, but changed her mind and didn’t sell. Rosie paid $6.75 million in 1999 for the estate. In 2008, Shaq’s manse was assessed at $26.4 million, but still sold for $10 million less. Rosie’s house was assessed in 2008 at $11.9 million. “Star Island has come down 50 percent from two years ago and we still haven’t hit bottom,” said Justo. Shaquille O'Neal's house on Star Island, Miami Beach, one of the most exclusive locations in Florida, sold and closed on Tuesday for $16,000,000. The 2-story architectural masterpiece was previously owned by former Miami heat player Rony Seikaly, who sold it to Shaq. According to published reports, the property was purchased by super-model Naomi Campbell's billionaire boyfriend, Vladislav Doronin. The property located at 26 Star Island Drive, is situated on a very large lot, measuring 106,888 square feet (just short of 2.5 acres) with 312 linear feet of waterfront. The 19,444 square feet house needs total renovation, as it has not been updated in years. Star Island sits like a floating jewel in the aquamarine waters of Biscayne Bay, between the main land and Miami Beach. 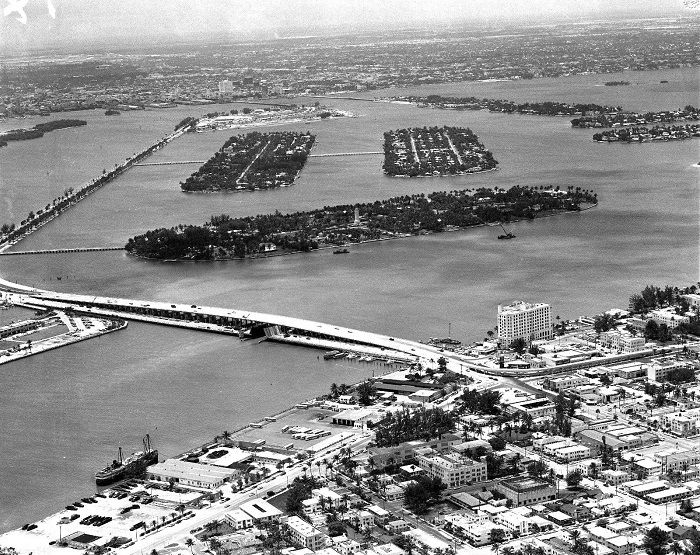 The waters surrounding the island are part of the Biscayne Bay Aquatic Preserve. Star Island is not only coveted for its supreme, unspoiled waterfront location and limited number of residents, but also for its extreme privacy. Accessible by just one bridge, the gated enclave boasts many famous residents as well as Miami’s wealthy elite. Star Island is a man-made island located in the city of Miami Beach, Florida. Completed in 1922, Star Island is considered one of the most exclusive areas of Miami Beach, and since 1986 has been home to Gloria Estefan and her record producer husband, Emilio. The Estefans' multi-million home is actually comprised of two homes, boasting six bedrooms, eleven bathrooms, a swimming pool, tennis court, and 15,547 square feet. Star Island also falls within The Key Biscayne Aquatic Preserve which is approximately 75,000 acres of state-protected land. Miami Heat center Shaquille O'Neal is looking to sell his Miami Beach home for $35 million -- $3 million more than when he first listed it in 2005. (NOTE): As of April 2009, Shaquille's house is listed on the market for sale for $22,500,000. The eight-bedroom, nearly 20,000-square-foot home is on Star Island, a private, artificial island in Biscayne Bay. The Mediterranean-style home, on a 2.5-acre waterfront lot, has an indoor basketball court, gym, steam and sauna room and a two-bedroom guest house, according to the property listing. An outdoor Jacuzzi, swimming pool, tennis court and dock are also on the property. The home was built in 1992 by another Heat center, Rony Seikaly, who sold it in 1995. Mr. O'Neal, who owns the home through a trust, bought the property for $18.8 million in 2004, shortly after being traded to the Heat by the Los Angeles Lakers. He listed the home for $32 million in 2005, less than a year after he bought it, and reportedly looked at properties in Fort Lauderdale before pulling the Star Island house off the market. In addition to leading the Heat to their first ever NBA championship last season, Mr. O'Neal, 34 years old, has also won three championships with the Lakers and an Olympic gold medal in 1996.